Summary: You’ll get a solid mid-range multi gym with the York Perform – from a manufacturer with a great record of quality products. This offers a versatile workout, with leg press, chest press, peck deck, arm curl and leg extension options built in. The weight stack checks in at 220lbs (100kg) for all options – backing the versatility with plenty of power. I like the design, with everything built in to a smart, surprisingly compact unit. You can find the full spec, along with the feedback from owners on this dedicated amazon.co.uk product page. 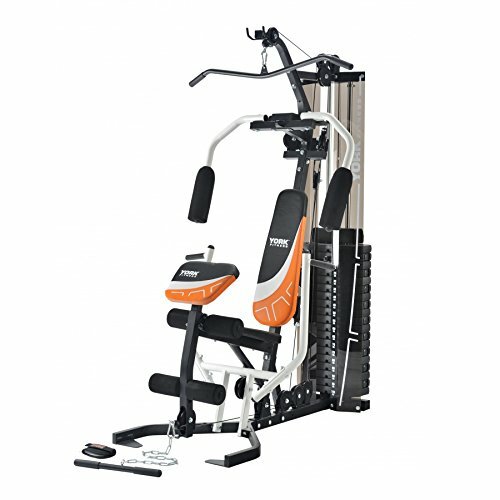 This review dives into the details of the York Perform Multi-Gym, and also highlights some alternative in the same mid-range price bracket. You’ll get a solid unit with the York Perform. This measures almost 2 meters high, by 141cm from front to back and 115cms wide. With the weight stack included it weighs in at 357lbs (162kg). The design looks smart without being fancy. This is primarily black, with metallic hardware for the weight stack and some distinctive orange touches. There are curved supports at the front, with solid bars at the bottom – keeping the unit stable. As with all home multi-gyms, assembly is needed. Comments from previous buyers said that the instructions for this are good – it bolts together easily. What I like about this model is that the full weight stack can be used for all the training options. There is plenty of padding for comfort. Sealed bearings are used to ensure a smooth resistance whichever option you are using. Compared to many home gyms in this price range, the corner-friendly design and bigger / versatile weight stack make the York Perform great value for money. One buyer had some trouble with the assembly, though overall the feedback for this model (at Amazon and elsewhere) has been very positive. Value for money came up as a plus point. Many gyms in this price range have smaller weight stacks. The way the design allows this unit to sit in the corner of a room – taking up less space overall than many similar sized options – also got some positive feedback. Overall, feedback said this was a solid gym, which compares well to similar priced models. Wrapping Up: Is the York Perform Multi-Gym the Right Option for You? This model fills a gap in the market. If you don’t have £1000’s to spend on a setup, and don’t want a smaller unit which lacks the weight stack options – then the York Perform is right for you. York Fitness has a solid reputation when it comes to home gyms, and the Perform model ticks all the right boxes. Check out the full details and read the latest buyer feedback on this dedicated amazon.co.uk product page now. There are two gyms with broadly similar price points and decent specs which I would suggest checking out. This unit looks great, in matt black and red. It has a very similar spec in terms of the exercise options and is a little narrower than the York Perform. The weight stack is 150lbs (67kg), smaller than the York model, though plenty enough for most of us. You can read my review of the Marcy Eclipse HG3000 – or check out the dedicated amazon.co.uk product page and compare for yourself. You’ll get 2 stations on this home gym, which might require a little more space. What I like about it is the versatility. There is a 360-degree system of pulleys, which allows you to use the leverage of the 72kg weight stack in a lot of different way. This is a little more expensive than the York Perform, though a very solid piece of kit. You can read my review of the BodyMax Bi-Angular Trainer here – or jump right to the amazon.co.uk product page and check out the spec yourself!